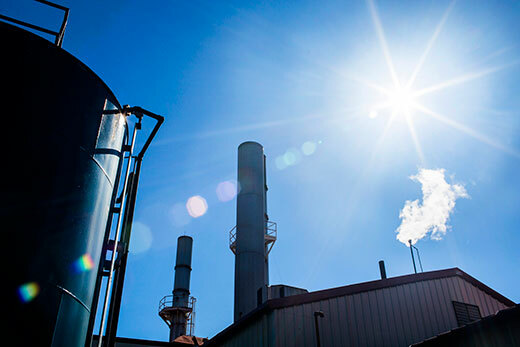 Emory has announced plans to launch a new $1.5 million Sustainability Revolving Fund, a self-replenishing program that will be used to fund capital-intensive energy and water efficiency projects across campus. The program is made possible by a $500,000 grant from The Kendeda Fund, an Atlanta-based private family foundation that invests in transformative leaders, ideas and community-driven solutions. The grant was matched by a $1 million investment by the University. With that commitment, Emory also joins the Billion Dollar Green Challenge, led by the Sustainable Endowments Institution, which works with colleges, universities and other nonprofit institutions to develop self-managed revolving fund programs to finance energy efficient improvements. Through revolving fund programs, participating institutions achieve reductions in their operating expenses and greenhouse gas emissions, while reinvesting the savings that are realized in future self-funded projects — a recycling of green investment. "The Sustainability Revolving Loan Fund will help Emory develop more energy and water efficiency projects, simultaneously saving natural and financial resources," says Ciannat Howett, director of Emory's Office of Sustainability Initiatives. "This is new for Emory," she says. "We'll be tracking our cost savings from energy and water efficiency programs that pay for themselves over time and putting that back into a fund to finance future projects — that revolving, ongoing aspect is what really makes it exciting." Employing that model, The Kendeda Fund contribution "becomes a gift that keeps on giving over time," Howett says. "Kendeda is providing initial capital, but it will really be here forever." The Fund "has pursued green buildings, and retrofits, as core environmental strategies in our community and across the country," explains Barry Berlin, with The Kendeda Fund. "This grant to Emory University marks the Fund’s first foray into sustainable endowments, a format that will continue to bear fruit for many years. "Under Ciannat Howett’s leadership, Emory has demonstrated real leadership in making the campus more sustainable," Berlin notes. "No institution better merits this revolving loan fund grant, hopefully the first of several in coming years." Until now, large-scale energy conservation projects at Emory were funded primarily through Emory's Utility Reduction and Energy Conservation Plan (URECA), which was created through the University's effort to reduce energy consumption per square use by 25 percent from 2005 to 2015 — a goal that has already been achieved, according to Howett. The new Sustainability Revolving Fund will effectively replace URECA, which was already scheduled to sunset at the end of the current funding cycle, says Howett. "It's serendipity," she says. "With URECA set to conclude, we have a new, exciting option — another path for funding new projects." The Sustainability Revolving Fund will support energy and water efficiency projects throughout campus. Schools and units will be invited to develop and submit proposals or business plans for projects that could offer long-term savings. For example, if a school submitted a proposal for a $30,000 project that, once completed, would create a savings of $10,000 a year in energy costs, that savings would be reinvested in the revolving fund for three years, until the cost of the project was fully paid off, says Matthew Early, vice president for Campus Services at Emory. "The fund will allow us to expand our vision for what projects we can take on," Early says. "It's a great concept — a way to manage a fund that can re-establish itself." The emphasis will be upon energy saving projects that can be tracked with proposals "that can demonstrate a contribution to Emory's utility bill," Early says. "If it saves money toward electricity, water or natural gas, then over the years that savings pays back into the fund — a dedicated resource that will always be there," he says. "And once it's paid back, the owner will continue to reap the benefits year after year." The new initiative is being launched at the same time that Emory is releasing its new Sustainability Vision and Strategic Plan, which articulates the University's ambition to "serve as a model of transformative practices and sustainability choices at every level." The plan charts a course of action over the next 10 years, amplifying and building upon Emory's work toward sustainability that has been achieved over the past decade, Howett says. "We've had an amazing committee working for a year and half to develop our new vision for the next 10 years," she says. "To be able to launch it at the beginning of our new vision provides a solid pathway for funding many of the goals outlined in our new vision." The revolving fund also affords a new, focused opportunity for giving at Emory, she says. "The fund creates a vehicle for donations dedicated to supporting energy efficient projects, a focal point for anyone who would like to make that kind of legacy gift to Emory — a gift that keeps on giving," Howett says. Not only does the revolving fund make sense for Emory, "it also allows us to participate in a larger national movement," Howett says. Faced with rising energy costs, many U.S. colleges and universities are seeking ways to finance urgently needed but capital-intensive energy efficiency upgrades on their campuses, she explains. The Billion Dollar Green Challenge has encouraged colleges, universities and other nonprofit institutions to invest a combined total of $1 billion in self-managed revolving funds to finance energy efficiency improvements. Through the revolving fund model, participating schools will achieve reductions in both greenhouse gas emissions and operating expenses. The Challenge was launched in 2011 with 32 founding institutions, which include Dartmouth, Harvard and Stanford. The Challenge now encompasses 57 institutions in the U.S. and Canada. In Georgia, participants include Agnes Scott College and the Georgia Institute of Technology. "We're proud that Emory is at the forefront of innovative ways to implement sustainability on campus," Howett says. "We have been recognized as a leader by The Kendeda Fund, and we're in good company in this Challenge."